Shoulder High Productions and StreamGuys recently teamed up for the Long Now Foundation's recent seminar About Long Term Thinking (SALT) at the Herbst War Memorial Theater in San Francisco, CA.Shoulder High Productions and StreamGuys recently teamed up for the Long Now Foundation's recent seminar About Long Term Thinking (SALT) at the Herbst War Memorial Theater in San Francisco, CA. While the seminar discussed the next big thing in human genetics, the show itself was produced with the latest in streaming technology and sent out around the world live. Chris Baldwin of Shoulder High Productions had been working with the Long Now Foundation once a month for the last two years, producing an on-demand podcast for their monthly seminars. "The client and I had been talking about making a live internet stream for this seminar, and we eventually found StreamGuys. The real intent was to test out the state of internet streaming, the client's ability to view it as it was happening, and how the quality would be." Andy Jones, sales engineer for StreamGuys, spoke on working with Shoulder High. "Chris had told me what the Long Now Foundation wanted, which was a very high quality video broadcast from the Herbst theater. He relayed to me the software they'd need and what the capabilities were of the DSL line they rented. We were familiar with Shoulder High from another event earlier in the month. There was a synergy there and they were very professional and accountable for their side of the project. It was a nice dry run for this bigger project." To put together a quality stream, the right gear was essential. Baldwin noted, "We integrated a couple different products. We used our Panasonic P2 HPX500 cameras, ImagePro scan converters, a Digital Rapids Stream Z encoder, and MAC laptops to embed graphics into the video and to capture a live feed directly into Final Cut Pro system. Finally, we rented a Panasonic HS400 switcher to bring all the elements together for the final show. We were shooting and capturing in a native HD signal, then we mixed it live between three cameras backstage. I was shocked, but even in San Francisco most of my clients' users were still using PC's so Windows Media Player became the most efficient and direct codec to encode to. StreamGuys remotely received the final encoded feed of the show and in the end took the most important part of the process, off of my shoulders." Jones described setting up the streaming for the event. "As far as setting up the streaming servers, we used a Windows Media server to receive a signal from the source encoder over the DSL line. The event ended up approaching the capacity of one of our servers, the anticipated audience size was more than it could handle. So, we created a load balanced stream where we received the source to one of our streaming servers and then relayed the source from one server to two servers. The link we provided the Long Now Foundation attempted to deliver the signal from server A and if it was full it would roll over to server B and the audience could connect to either one." While the seminar discussed the next big thing in human genetics, the show itself was produced with the latest in streaming technology and sent out around the world live. Keeping the stream in a manageable format for multiple users proved difficult, as Jones said. "One of the challenges was making that one format work across as many viewer platforms and browsers as possible. The Long Now received many positive comments about the quality of the stream. There were a few instances of people not being able to view the video, but there's no magic bullet for everyone's machine, whether it's a browser or operating system or media player or a broadband/DSL issue. Any one of those things can throw a wrench in there. But streaming video always is a challenge for large events like this. The 400kbps stream was encoded in the Windows Media format at a 480 x 270 window resolution to present a high quality, 16:9 aspect ratio image to viewers." Baldwin agreed, "You know, the internet has supposedly entered Web 2.0 where it claims to have matured into being a media rich delivery environment, but it's still constructed on dispersed and un-unified set of technologies. We're getting close and I think the age of internet content being accessible on your TV with great quality is close. However it's a triangle still where you have to find the balance between size, quality, and universal playback for people's varying OS, software, and internet connection speed. We knew we could get out choppy video and okay audio, but our goal was to deliver a new bar for quality, size and smoothness of video. The StreamGuys' expertise really helped out." StreamGuys were given a chance to correct any users errors prior to the seminar based on a test link they put up on the site before the show. Jones explained, "One nice thing on this event was the tune in link was known a few days before the broadcast, so we were able to use a prerecorded file on loop as a placeholder for the stream. It served as a systems test for those who wanted to check out the stream. Based on the test show, we knew what would work. Then we discussed frame size and frame rates for the video and the sample and bit rate for the audio. We also helped figure out settings with the buffer and the encoder." Overall the show was an astounding success and both the Long Now and Shoulder High will be pursuing similar shows in the future, as Baldwin explained. "This was an exciting opportunity for me, because I was able to bring together and evaluate the smaller yet powerful Panasonic HS400 switcher, which brings four big roll-in cases down to one and a half. As more clients request a live internet stream the venue becomes more and more unpredictable and I need to move towards a solution that allows for a smaller footprint and faster setup. 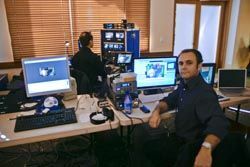 The other component of these productions was to integrate my existing tapeless workflows together with a live switch, live stream production. So for me, as much as it was an exercise in streaming over the internet, it was also a fabulous example of a full and complex production workflow in a completely tapeless environment." While the event was a success, Baldwin feels that the industry of live streaming shows still has to be perfected a bit. "Its not just large shows with massive budgets that are trying to produce live streams any longer. And the solution of a peer to peer PC based video web conference is no longer novel or truly powerful enough of an experience any longer. For these smaller clients production and streaming costs are still a stretch. There's a lot to take into consideration in terms of the users' perspectives. As we continue to Web 2.0, I'd hope that in the next year this era brings some unified solutions to pump live video in high quality without too much headache." Jones agreed, commenting on the need for a quality connection. "We pride ourselves on being flexible for single event broadcasts to make sure everything goes as smooth as it can. Often the internet connection on site is a big issue, but Chris was able to secure a great line. The cost of travel and the expense of moving people around the world to attend these types of meetings is causing streaming events to be more attractive." Baldwin summed up the event from his angle as a producer, "It was a fabulous event because we weren't only able to reach out to a bigger group, but to show all the different components and new technologies working together flawlessly. There wasn't just one person or set of experience that was being drawn upon, it was collaboration of industries."